Just days after Marvel made the surprise announcement that Avengers: Infinity War will arrive one week earlier, on April 27, New Line is adjusting their slate accordingly by moving Rampage one week as well. Originally scheduled to hit theaters on April 20, the studio has pushed the movie to April 13, with sources claiming that producers want to preserve a "two-week cushion" between Rampage and the surefire blockbuster-to-be, Avengers: Infinity War. Dwayne Johnson also took to social media to announce the new release date, while showcasing a new poster as well, along with all the International versions for it. The release date push now makes April 13 one of the most crowded dates of the year, with a whopping six movies opening in wide release, although it wouldn't be surprising if at least one of these movies shifts to Rampage's old slot on April 20. As of now, though, Rampage will be going up against Universal's thriller Truth or Dare, Pantelion's Overboard remake, Mirror/LD's drama The Miracle Season, Neon's drama Borg Vs. McEnroe and Fun Academy's animated movie Sgt. Stubby: An American Hero. Currently slated for release on April 20 is 20th Century Fox's comedy sequel Super Troopers 2, Focus Features' comedy Tully and STX Entertainment's I Feel Pretty. Surprisingly, no movie has moved to the May 4 date yet, which only has Strand's The Desert Bride and Music Box Films' The Guardians opening in limited release, with no wide release movies thus far. It wouldn't be surprising if the movies still slated to open on April 27, Electric Entertainment's thriller Bad Samaritan and Lionsgate's Traffik, would shift to May 4 or another date to shift away from Avengers: Infinity War, which is expected to dominate no matter what weekend it opens during. While the first weekend of May is typically the start of the summer movie season, Marvel and Disney have thrown quite a big curveball and it will be interesting to see how other studios continue to respond. Rampage's release date shift also puts it one week before Paramount's thriller A Quiet Place, Universal's raucous comedy Blockers and Entertainment Studios' thriller Chappaquidick and two weeks before Warner Bros.' highly-anticipated Ready Player One. That adaptation of Ernest Cline's novel, directed by Steven Spielberg, would have had a three-week run without another "tentpole movie before all of this release date shifting took place, so that may affect its box office take as well. 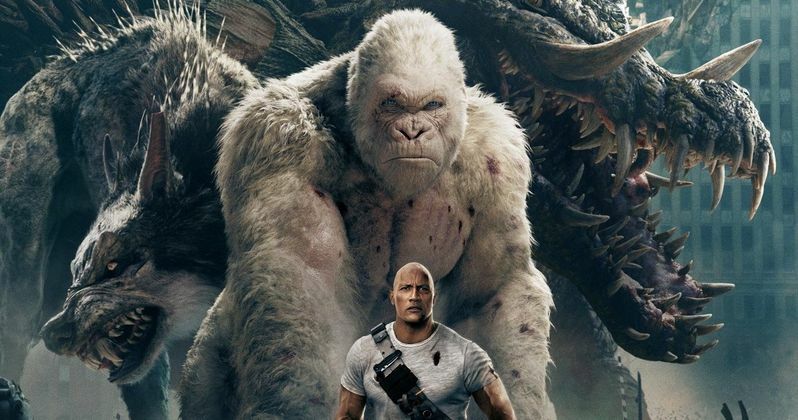 While Rampage may have a bit more competition than it had before, the video game adaptation, which has reportedly been testing very high, is still in a good position for two strong weeks at the box office, before Avengers: Infinity War takes over. As for the new posters, they were posted by The Rock on Twitter earlier today, which are all the same poster designs, but in different languages for four countries, Brazil, Turkey, Thailand and Romania. After the domestic debut of Rampage on April 13, the movie will open around the world on April 20. Dwayne Johnson leads a cast that also includes Naomie Harris, Jeffrey Dean Morgan, Malin Akerman, Jake Lacy, Joe Manganiello, Marley Shelton and P.J. Byrne. The Hollywood Reporter broke the news on the release date earlier today, and you can check out the international posters below.